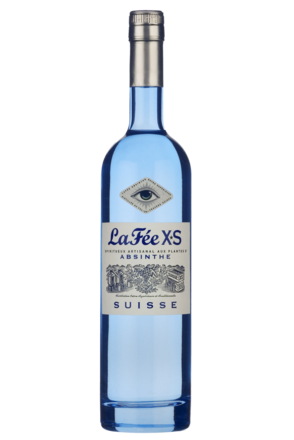 The story of La Fée is inextricably linked to one man’s discovery of absinthe at a time when it was either banned or thought to be banned in much of the western world, and his quest to legalise its sale, celebrate its history, drinking rituals, and place in cocktails. The man in question being George William Rowley. 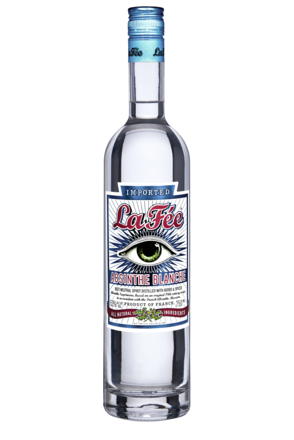 He not only created La Fée, he more than any other drove absinthe’s reincarnation. Like so many who have become drinks industry entrepreneurs, George’s career started in the corporate world, in his case as an international claims broker at Lloyd’s of London, dealing in the risks associated with terrorism, riots, strikes and cyclones across the world. In 1992, a position with the largest broking house covering the Czech and Slovak Republics led him to move to Prague. 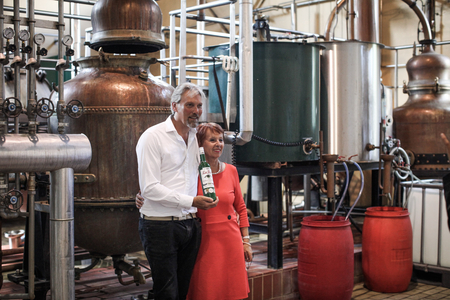 George arrived as the region was transitioning from the grip of the Soviet Union after the 1989 Velvet Revolution and his clients included biggest breweries and state-owned distilleries in Bohemia on the Czech side and Moravia in Slovakia. He quickly learnt about the Czech Republic and its traditions – including that carp, the country’s traditional Christmas Eve dish, are sold live and then kept in domestic bathtubs for several days to purge the fish of their muddy bottom-feeder taste. More salient to this story, he also came to appreciate Czech beer and its fullness of flavour. Bohemia is after all considered the birthplace of lager-brewing. Almost every town in Bohemia and Moravia has its own brewery, producing beer which is pasteurised to only give it a relatively short shelf life – from a couple of months, at which point it is at its rawest, most intense, and, arguably best, to six months at the most. However, most exported beer, is pasteurised to at least 12 months’ shelf life in order to extend its commercial life, in George’s view, completely changing its body and flavour in the process. He felt there was an opportunity to export the good stuff, beer with a maximum shelf-life of six months that retained its body and integrity. If milk could be exported with only three to seven days’ shelf-life, he surmised it would be relatively easy to export beer that was good for six months. 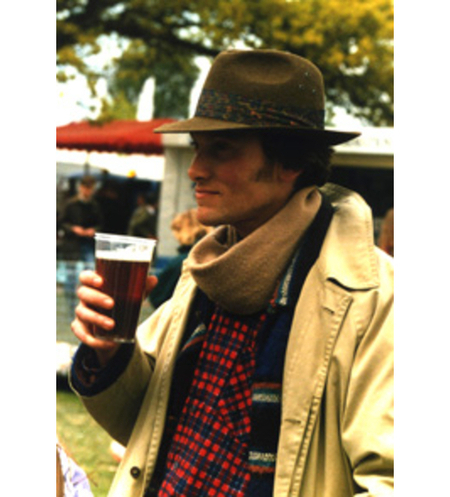 So in 1996, George set up his first company, Bohemia Beer House Limited, with the aim of exporting Czech beer to the UK. His intention, to continue enjoying time in Prague whilst at the same time moving back to England, and his family home, Bayford Hall in Hertfordshire. Within six months, he’d signed up breweries producing Lobkowicz, Rebel and Franclov, as well as his first spirit, the Czech national liqueur, Becherovka. His time in the insurance industry has led George to be a stickler for detail and process. He loves paperwork. So upon returning home to start his drinks’ business, one of the first people he contacted was his local Trading Standards Officer, a chap called Paul Passi, who helped with labelling regulations. Paul would later prove pivotal in helping George bring absinthe back to the UK, Europe and much of the wider world. For as this story unfolds it will become clear that it was George who led the rediscovery of absinthe in the UK, and then much of the world beyond. George’s family pad in the midst of the English countryside became something of a beer warehouse and when the first 14 wheeled-truckload arrived in 1996, the winding English village lanes and the non–English speaking Czech driver proved a challenge. The beer was transferred to the house’s cellars by an improvised shute made of scaffolding boards laid over the stairs. To comply with European labelling legislation, for the first few shipments, George had to open every case and hand-glue a new back label to each bottle. So began George’s life in the drinks industry, selling traditional Czech Beer and various interesting spirits to London’s top-end bars, with his beloved Wedgewood blue 1969 Triumph Herald 1360 Convertible stuffed full of samples. During 1998 he expanded his offering, adding Czech plum brandy Slivovitz and Bohemian Sekt, a sparkling wine. Then in 1998, he came across Bohemian absinth (without the final ‘e’). John had persuaded the distiller to post supplies of absinth to his home in London for his personal consumption and private sales to a handful of friends, but he had yet to develop absinthe importing into a business due to legal and logistical obstacles. Although he had, in conjunction with Gavin Pretor-Pinney and Tom Hodgkinson, writers and editors of The Idler, formed a company called Green Services Limited. 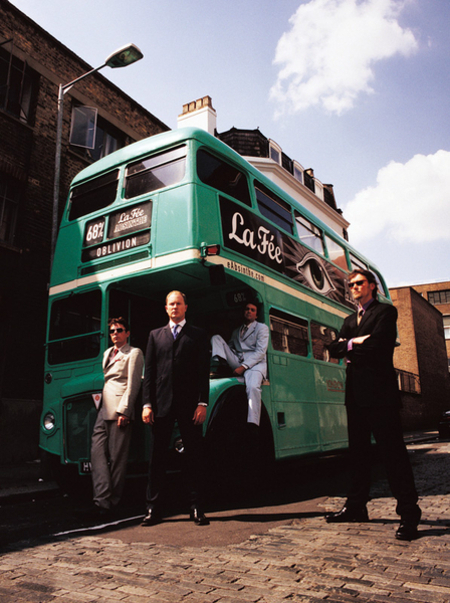 George met with the three early in 1998 and it was agreed that they would handle public relations and assist with marketing, while George would take on the challenge of setting a legal precedent for the sale absinthe in the UK. So Green Bohemia Limited, an amalgamation of the previous two company names, Bohemia Beer House and Green Bohemia, was born. “There is nothing like a good technicality”, George Rowley says when recalling his quest to legitimise, if not legalise absinthe. Few appreciate and even love bureaucracy, but George Rowley does. Absinthe was all the rage across turn-of-the-century Europe until governments started to ban its sale with the French ban of 1915 effectively eradicating the spirit from most of the world’s bars. Prior to George’s involvement in absinthe, few had much interest in seeing its return, and those that did simply didn’t spend as much time scrutinising the terms of each nation’s ban for loopholes. Had they done so, they’d have found that the 1915 French ban only applied to the sale, rather than the production of absinthe, leaving the way open for a French distillery to produce it, quite legitimately, for export. George became the first to exploit this loophole (as you’ll read later). George also discovered that both France and Italy completely forgot, or didn’t bother, to make provision for their absinthe bans when signing up to the Treaty of Maastricht. Under EU rules, if a product can be legally sold in one EU member state, it may, in theory, be sold in all of them. Best of all, he found that the United Kingdom had not banned absinthe in the first place. It was never heavily consumed by the average Brit and both WWI and the French ban effectively meant that absinthe supplies in Britain simply dried up. In his words George “threw the EU and UK legal booze book at it”, particularly a document called EU Council Directive 88/388/EEC. His persistence and some help from his friendly local Trading Standards Officer, Paul Passi, led to the first legal government-signed document on absinthe issued by an EU country since the blanket absinthe bans took effect around the world between 1898 and 1932. This watershed document set the legal precedent for absinthe sales in Europe, though at the time it was done in respect of absinth [without the ‘e’] from the Czech Republic, which in 1998 wasn’t an EU member state. 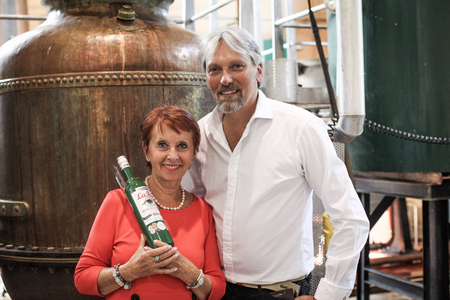 Having established they could legally sell absinth(e) in the UK, John Moore and George negotiated and signed their first contract with a Czech distiller to produce their first absinthe on 9th November 1998. The first to be made and shipped into Europe since the bans in the early 1900s, this was absinth [without the ‘e’], made to the Czech style without the heavy anise found in traditional absinthes. It is important to distinguish these two very different styles – both of which are now available under the La Fée brand. Having arrived back in Prague after signing the contract with the distillery, and in celebratory mood, they headed to one of George’s favourite Prague hangouts, Café FX, above Wenceslas Square. There they witnessed for the first time absinth being burnt as part of the absinthe drip Sugar & Burn ritual. This proved a pivotal discovery and after they launched their absinth in the UK (in November 1998), it was this ritual that consumers, the media and the bar industry latched onto. It quickly captured the public’s imagination and led to something of a British absinthe craze. Importantly, this contemporary Sugar & Burn serve was only ever promoted by George with Bohemian absinth [without an ‘e’]. This serve upsets purists to this day in the same way that cocktail geeks are upset by a French Martini being called a ‘Martini’. I’m guilty of being such a geek, but both fruity “Martinis” and the Sugar & Burn ritual undeniably both played a crucial role in the late 1990s boom in London cocktail bars. Consumers liked them and few of us knew any better at the time. A date was set for a launch party at London’s Groucho Club. Tom and Gavin worked the media, setting up exclusives with the Daily Telegraph and Evening Standard. I (Simon Difford) helped George spread word to the industry and introduced him to John Coe, whose company became the first distributor of absinthe in the UK since the pre-war ban. The first shipment caused more trouble than anyone could imagine. The whole consignment was seized by German customs as it crossed the border from the Czech Republic, and it was only after faxing documentation to establish that the goods would not go through France that the vehicle and goods were released. This hiccup caused a delay of several days, and involved diverting the load north, on a much less direct route through Holland. With the goods still in transit but the launch date fixed, one of the newspapers broke the “exclusive” story almost a week before the date which had been agreed upon. Bizarrely, this turned out to be a stroke of good fortune. The article was read by Johnny Depp, coincidentally filming Sleepy Hollow in Hertfordshire, just up the road from George’s home. The star’s fixer called George saying that Mr Depp was shortly departing by private jet to spend the weekend with Hunter S Thompson and absolutely had to take a bottle of absinth bottle with him. It was a potential PR coup but the absinth was still on a truck crossing Europe. The partners poured the little sample stocks they had between them into a bottle, just filling it and this was communicated to Mr Depp’s personal assistant who despatched a white stretch limo to collect the precious liquor. Meanwhile, a lone case of twelve bottles sent via DHL arrived at George’s home with four of the bottles broken in transit. The limo driver was diverted and Johnny Depp became Green Bohemia’s first customer. This left just seven bottles for the launch of Hill’s Absinth that evening at London’s Groucho Club. Following the launch, The Daily Telegraph published its exclusive on its front page, catching the attention of Jeremy Paxman of BBC2’s Newsnight as he reviewed the next day’s papers in the final 30 seconds of the programme. The next day, the intrepid entrepreneurs received a call from the BBC asking if they could demonstrate the Sugar & Burn ritual on Newsnight that evening? The demonstration was duly filmed at Detroit, a funky London bar sadly long since closed. The genie Green Fairy was literally out the bottle and it seemed everybody wanted to experience the absinth Sugar & Burn ritual. The reintroduction of absinthe in the UK was questioned in The House of Lords, while many County Councils were mistakenly pulling George’s product from bars. That was until they were presented with copies of the original EU certificate vouching for its legality. Against this background and the fact that the product they were selling (at 68% alc./vol.) was one of the most alcoholic products available in the UK, led George to take a measured educational approach to brand development. He was concerned about any negative press and its potential consequences so concentrated solely on the top tier of UK bars. To their cost, they quickly learnt that when demand is created and not entirely fulfilled, it takes very little time for the gap to be filled by others. A plethora of cheaper me-too products flooded the market, most of them electric blue-green in colour and made in Poland, Hungary, Ibiza and the Czech Republic. Fearing the effect these ‘absinthes’ could have on his brand, George sought the high ground. The product he had been selling was a Bohemian absinth [without an ‘e’] but in 1999 he embarked on a campaign to source a genuine pre-ban absinthe and restart production in France or Switzerland. His hope was that, in the case of France, that the French ban prohibited only the sale, but not the production of absinthe. So started his search to find a traditional recipe and a distillery to make it – preferably one that had made absinthe prior to 1915. George approached Madame Marie-Claude Delahaye, owner of the French Absinthe Museum in in Auvers-sur-Oise, a small town some 18 miles north-west of Paris. She is one of the world’s most renowned absinthe experts and curators the world’s biggest archive on French absinthe. Madame Delahaye recognised George from the press coverage of his UK launch and his promotion of Sugar & Burn, so as a purist she understandably gave him a very frosty reception. By now George had discarded all his other beer and spirit activities, his company becoming the first to devote itself entirely to Absinthe, and the only globally active company dedicated 100% to its promotion. Determined, he revisited Madame Delahaye and convinced her of his sole objective, to produce the most authentic French absinthe. 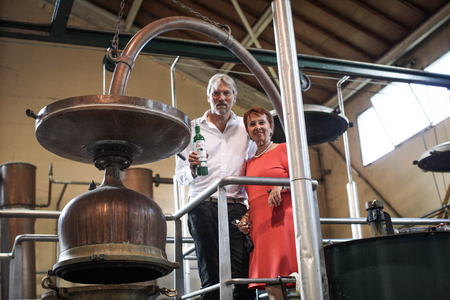 A distillery was found that was prepared to work with Madame Delayahe and George, one which had an original working still that had been used for absinthe before the ban. Many test distillations later and La Fée Absinthe was created – in the words of Marie-Claude Delahaye, “the first Traditional French Absinthe to be commercially produced in France since the ban of 1915”. 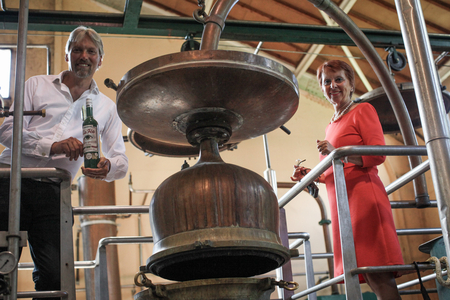 The first order for 7,000 bottles was placed on 5th June 2000 following a confirmation fax received from the distillery reading, “We are pleased to confirm that we have been authorised by the French government office to produce Absinthe La Fée for export market only”. In March 2003, George overcame the French ban on the sale of absinthe by changing the name of La Fée Absinthe to La Fée Aux Plantes d’Absinthe, that is to say not Absinthe, but made from the plant of the same name - enough of a difference to make it acceptable to French customs. To this day each distillation is tested by Madame Delahaye, each batch delivered to her by courier for her approval prior to bottling. George had established a good presence in club and cocktail bar culture with the Czech absinth Sugar & Burn ritual and people liked the Czech absinth’s vibrant blueish colour and low-anise flavour. His first product, Hills Czech Absinth had put absinthe on the map in the same way the wedge of lime in the neck of a bottle of Sol beer drove its sales in the 1980s. However, it was completely alien to the tradition of pre-ban Absinthe. Having developed a genuine French absinthe – Le Fée Parisienne, George sought to produce a similarly authentic Bohemian absinth to replace his existing Hill’s Absinth. He wanted to correct the imbalance between the integrity of the two styles - to celebrate the success of the Bohemian absinth flavour profile. George’s first stop was the Schimmel Library, Europe’s oldest and most authoritative collection of works on herbalism. This privately-owned library contains texts so rare and valuable that they are permanently stored in air-conditioned vaults. Here he found documented recipes, sent from the library to Bohemia in the 1890s. These formed the essence of what became La Fée Absinth Bohemian. Not to be confused with pre-ban French Absinthe, this has its own taste profile in the Bohemian style. It was made for its ability to blend, mix and layer, not to mention burn. 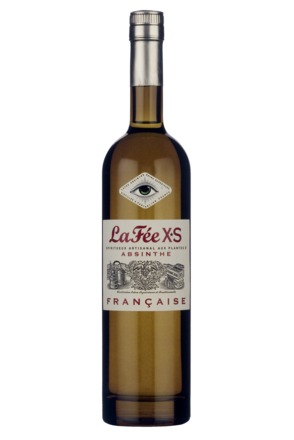 Traditional Absinthe lovers will be glad to know that sales of La Fée Parisienne French absinthe far exceed those of La Fée Bohemian Czech absinth. That said, La Fée Bohemian outsells most of the other absinth brands in the market, while of La Fée Parisienne is perhaps the best-known international brand of absinthe – sold across North America, Asia and Europe.